People with criminal records often face obstacles to obtaining affordable housing. They can be denied housing based on arrests without subsequent convictions, old and outdated convictions, or criminal records that have nothing to do with a person’s ability to be a good tenant. In this Advocacy in Action webinar, presenters will share their experiences using litigation and advocacy to eliminate such barriers to federally subsidized housing and housing in the private rental market. Marie Claire Tran-Leung, a former Shriver Center attorney and author of When Discretion Means Denial: A National Perspective on Criminal Records Barriers to Federally Subsidized Housing, will open the webinar. Fred Fuchs of Texas RioGrande Legal Aid will discuss his success challenging unreasonably long lookback periods used by AIMCO, one of the largest owners and operators of apartments in the country. John Relman, managing attorney of Relman, Dane & Colfax PLLC, will discuss Fortune Society v. Sandcastle Towers Housing Development Fund Corporation, one of the first cases to challenge a private landlord’s blanket housing ban on applicants with criminal records as a civil rights violation under the Fair Housing Act. And Laura Tuggle, executive director of Southeast Louisiana Legal Services and former general counsel for the Housing Authority of New Orleans (HANO), will talk about the strides made, setbacks experienced, and lessons learned in the ongoing advocacy campaign to improve HANO’s criminal-records policies. Location: MainStage of 12th Avenue Arts, 1640 12th Avenue, Seattle, WA! The Old West scf-fi adventure, The Tumbleweed Zephyr, returns to the thrilling, steampunk-inspired universe of the 2013 production The Clockwork Professor. Two brothers, Atticus and Kai, climb aboard the Tumbleweed Zephyr, a transcontinental train headed out of New Providence for the wilds of the Western Territories. But what starts as a simple journey by rail soon takes an unexpected turn, with airship bandit raids, twists of fate, wayward sparks of romance, and the lonely call of a train whistle echoing across the clear desert sky. So grab your satchel and dust off your best traveling hat for this epic new summer adventure! 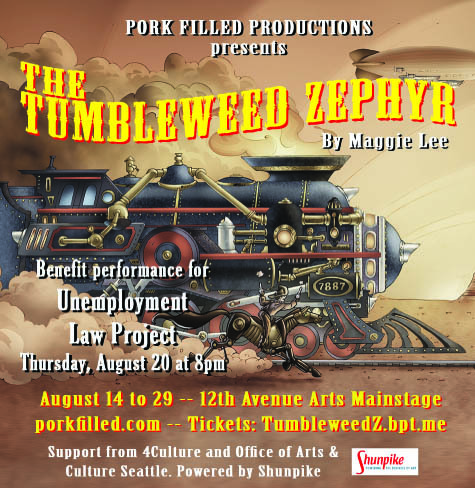 The Tumbleweed Zephyr is pulling into the station at the MainStage of 12th Avenue Arts, 1640 12th Avenue, Seattle, WA! The August 20th performance is a special benefit for ULP. OneAmerica, Northwest Immigrant Rights Project, Asian Counseling Referral Service, Immigrant Legal Resource Center and New Americans Campaign are cosponsoring a training on naturalization and citizenship, August 27-28 at the University of Washington School of Law. The training is free for participating staff from non-profit organizations and committed volunteer attorneys working in naturalization and citizenship issues in the Seattle Area. Participants must attend both days to receive 8.5 CLE credits – WSBA approved and sponsored by American Immigration Lawyers Association (AILA) – Washington Chapter. Space, however, is limited.For questions about the training, please feel free to email Sarah Sumadi, Washington New Americans Program Manager at sarah@weareoneamerica.org. Join us for a great night of basketball with the Seattle Storm. Enjoy the game with ULP staff, board members, volunteers and friends. 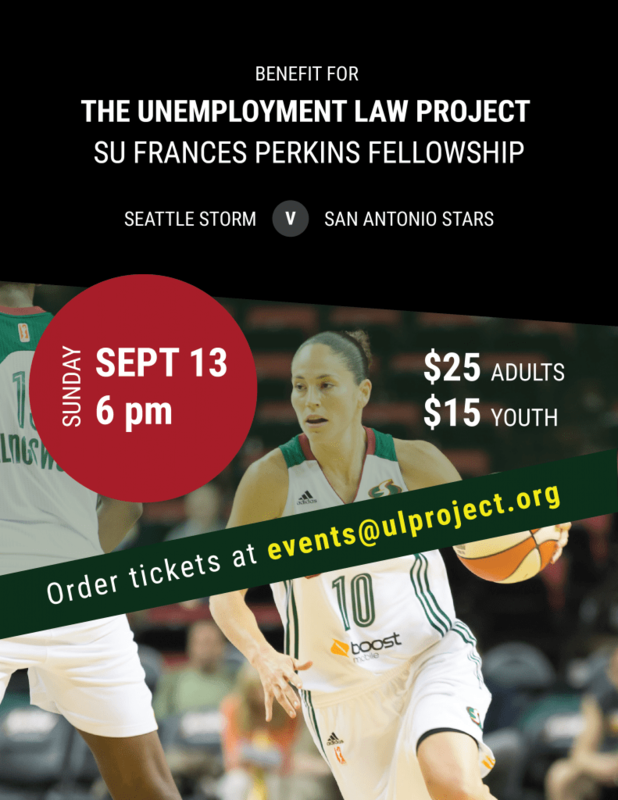 Funds raised from ticket sales by ULP will fund the SU Frances Perkins Fellowship. Andres Munoz, the first Perkins Fellow, will start at ULP in September. The fellowship will provide outreach and advice in immigrant communities in our region. Buy your tickets today by emailing events@ulproject.org.